So, I’m able to take one more bag than I had initially planned. I e-mailed my contact and they were able to get me 2 bags full of supplies for the kiddos over in Ghana! I’ll need to rearrange some baggage, move some stuff here..some stuff there – stuff some shampoo in weird spots and all the fun that goes into packing – but how exciting! I weighed each parcel and came up with a grand total of 115.6 pounds. I joked with my mom about whether or not I should take clothes…she asked if I had to take my roos……is underwear necessary!? 😉 JUST KIDDING!!! SO, when school’s out – I’ll be shopping for THIN items of clothing. I think it’ll all work out perfectly – and the other good news is – if I understand correctly – this is most of the stuff that OSD was able to collect! I’m rethinking taking the video camera because how cool to see the kids when they get their new stuff. ANOTHER good news tidbit – my darling husband bought me a lens cap to replace the one I lost from my camera (yes..the lens has 2 chips..very tiny, haven’t shown up on any photos..still beautiful pics!) so that’s exciting news too!!! It’s just a good day and I can’t wait! THANK YOU OSD!!!! May you have a good day too, dear reader! 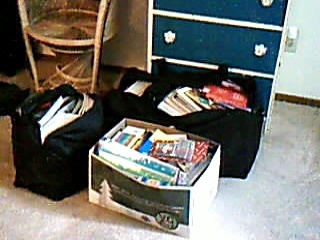 Good news – I’m able to take one more bag than I thought – this means more school supplies for the tykes over yonder. So, we’re at the stage of my trip where I need to buy my ticket. I’d been spending hours on the internet, so much that my husband was a little put out and jealous of the computer – whoopsie! Well, so I’d found the cheapest dates, plotted out my entire trip. I call US Airways…”can you help me do a flight through British Airways?” Oh yes, they say – not a problem. Well – after a confusing start to the phone call – should have been my red flag…we finally get my Columbus to London booked…she’s transferring me to the BA line…wait, I thought she was doing that…ok, whatever. The wait time..35 minutes! Shoot, I can do it online. WRONG! Did you know, aside from the little 3 digit code on the back of your MasterCard – there’s another secure code that some issuers use to prevent fraud? Me neither – now I do! Well, guess what!? Chase is just merely “pursuing” an agreement or something with MC – read the back of your card, it’s there. What’s this mean? They’re not part of the ever loving fraud preventing banks that use the Secure Code thing. SO – next day, I call BA…”We’re sorry, we can’t book your travel over the phone. That ticket is a credit sensitive ticket. You’ll either need to go to a BA office or use a travel agent.” Ok…I’m a member of AAA…I’ll go there tomorrow. Few days pass…make it to AAA. I wait..and wait – my name is called, I say “I need to book my ticket to Accra, Ghana please.” …”Ok, where are you departing” …uh oh..”London – Heathrow”…okay..lady says “Oh, we can’t do that ticket because it doesn’t originate in the United States…had we booked it from the beginning we could have because it would have started here – but with the new regulations, sorry – we can’t do it.” Nice. Uh…now what? I call US Airways the next day….she walks me through – fixes errors the first person made in my contact information..”I’m sorry, we can’t do British Airways…you’d have to go to an office…there’s one in Chicago, Phoenix….” I tune out for a moment..My Mommy lives in Phoenix! So, my Grandma’s in AZ at this point…Mommy didn’t make it to the airport for me yet…she went to Chicago this week..guess what? The BA office in Phoenix is open 1430 – 1830. Nice hours, huh!? So, hopefully she’s able to secure something by Friday on my behalf…then comes the application for the visa! I must confess, at this point – what I thought was going to be an out of pocket..maybe 2K trip is surely adding up..I know it’ll be worth it..Every year I save my birthday money and Christmas money until I find/think of something I really REALLY want…fortunately, I hadn’t wanted anything for a while – so I was able to save that and all of the money I earn on the side – and I’m using that. Aside from the ticket hiccup, everything’s been pretty smooth sailing. In fact, I’d emailed the principal at Ohio School for the Deaf (OSD) to ask them if they’d like to make cards, write letters – whatever their little hearts desired – and I could take that to Ghana…well, after a week or so – I was contacted by Jean Parmir – she’d told me OSD did a fundraiser collecting school supplies after Jessica came to the school and did a presentation about HER month long trip that she recently took. They were so inspired, they wanted to help the Deaf school in Accra – well, I may not make it to that one, but it’s still going to Ghana..oh, what’s still going there? I forgot that part…So, I was put in touch with someone named Melissa over at OSD – I picked up a box of school supplies yesterday – erasers, pencils, all sorts of stuff. They still have 11 more paper boxes FULL of supplies that they can’t afford to ship over there at $800 per box. That’s a hefty price tag for anyone, not to mention a school that just had to make tons of cutbacks due to the recent money troubles of our nation. Well, I’d not thought of it until I was visiting my friend to see her BEAUTIFUL new baby girl 😉 Her husband pointed out….I may want to check in to if I’ll have to pay something for bringing all of that stuff in….any thoughts out there? So..this is where I’m at in my journey…mosquito net…school supplies – the only somewhat definite things I’m taking 😉 Nighty night!